Evaluation How to go on with dissent? All of us are §129a! 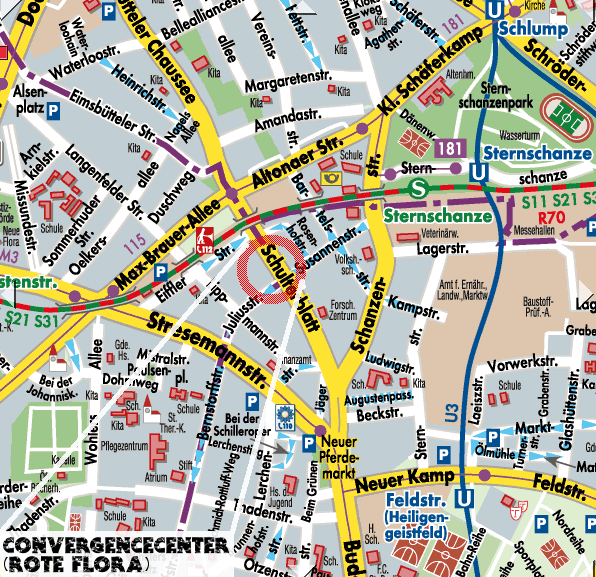 In Hamburg there will be a Convergence Center open from 25th of May to 10th of June. The Convergence Center Hamburg (CCH) is next to the ones in Berlin and Rostock one of three Convergence Centers that are build up for the anti G8-protest. Furthermore the CCH wants to support the protests against the EU-summit, that takes place at the same time from 28th-29th of May. The Convergence Center in Hamburg is open from 25th of May to 10th of June. That means during that time you will find there people, information, food, workshops and information about accomodation. 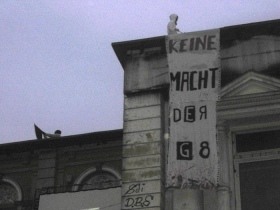 On 2nd of June we encourage all people to go to the camps in area around Heiligendamm und shut down the G8-summit. We will collectively travel from Hamburg to Rostock on 2nd of June. The CCH wants to support activists, who come to the protest against the EU-summit in Hamburg or the G8-summit in Heiligendamm. We want to give internationals and people from other parts of Germany place where they can come after arrival, rest, gather, get the latest information, get some food, find places to sleep and meet other protesters. This is a huge project and we still need a lot of helping hands, so please feel invited to join the ConvergenceCenterCrew when you arrive in Hamburg. 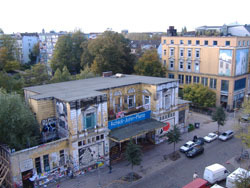 The CCH is in the autonomous social centre called "Rote Flora" (picture) in a part of Hamburg called "Schanzenviertel". 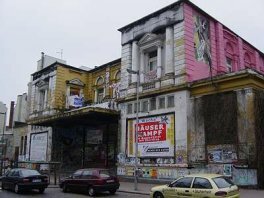 The "Rote Flora" is squatted since over 15 years and is the largest of the autonomous spaces in Hamburg. It used to be a theater before it was squatted. If you arrive by plane at the Hamburg-Luebeck airport you take the bus to Hamburg. There you arrive at the central bus station close to the main train station. If you arrive at the Hamburg-Airport you take a bus or the underground to the main train station. 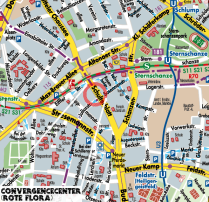 Then you take the city train called "S-Bahn" to the Station "Sternschanze". There you get off. Now you are in walking distance to the Convergence Center (map). If you come by train or overland bus then you arrive as well at the main train station or the nearby central bus station. We need all your receipts from your journey to Hamburg, doesen't matter if it is by car (petrol quittance) by train or by plane(your ticket)! Pleace bring the receipts to the info point when you are arriving! Although it is not possible to sleep in the Convergence Center "Rote Flora", nobody has to stay outside or without a sleeping place. We offer a coordination for sleeping places. There are loads of sleeping places in Hamburg, some are private ones, some not. We collected them all and we can tell you and your group where to find a place to sleep (for free of course). You can come to the sleeping place coordination in the Convergence Center or call via phone (number is published later on). 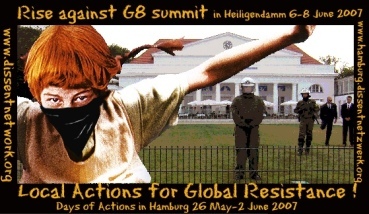 In the context of the mobilisation against the G8 summit from the 6th to the 8th of June in Heiligendamm we plan to set up Convergence Centers ("places to gather") in Rostock, Berlin and Hamburg. In addition to the camps we want to create solid spaces for those arriving and a platform for open participation of activists from other cities and countries. 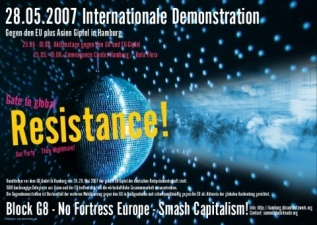 Why do we need a convergence center in hamburg during the of 26th of may and the 10th of june 2007? 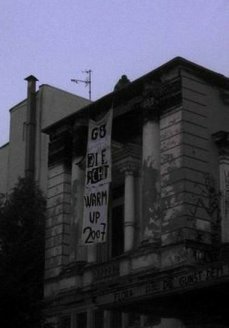 Since the Worldbank summit in Prague in 2000 Convergence Centers have been set up by local structures to support protests against events of symbolic concentration of power. Expecting the G8-Meeting close to our city a local anti-G8-structure developed during the last years (particularly after the G8-summit in 2005 in Scotland) and led after the Camp Inski in summer 2006 to the idea of a Convergence Center in Hamburg in the Rote Flora. We think it is helpful to have CCs already before the big protests are starting and also after the actions in Mecklenburg-Vorpommern, so that there are contact points, rooms to prepare and also for retirement to other bigger cities nearby. For this reason the CCs in Hamburg and Berlin will stay open also during the protests near Heiligendamm. 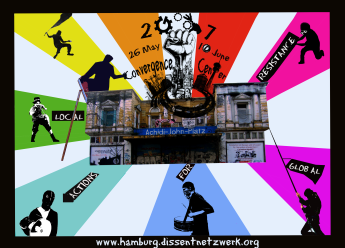 To support protests against the G8-summit in Heiligendamm we are organizing a Convergence Center in Hamburg from the 25th of may to the 10th of June in the Rote Flora, a left political project being occupied since 16 years, uninhabited but used in various ways. Believing that it is reasonable to have an autonomous space already ahead of the summit, we want to offer a place where people can meet, get connected and prepare their protest. One of our principal ambitions is to provide a good base for international activists to prepare their resistance in Germany.